Please note whereas I try to ensure that what I publish is correct, and to differentiate between what is supported by documentation etc, and what is, in my opinion, a reasonable assumption, everything should be treated with caution. If you have come across information that you believe is relevant to your own research please either verify it independently or drop me a line to confirm its validity. Equally if believe something is incorrect, or if you wish to add any details or discuss please get in touch using the Contact Form. If you have come to this page via a browser, I hope you will find something of interest here or elsewhere in our other Hendry Family History Pages. John Hendry born 3 Mar 1805, Alloa, Clackmannashire. Birth is recorded in the Alloa parish register and identifies his father Ebenezer's profession as "merchant". Nothing more known. Peter Hendry born 18 Aug 1806, Alloa, Clackmannashire. Birth is recorded in the Alloa parish register. Nothing more known. Ebenezer Hendry born 3 Mar 1811, Alloa, Clackmannashire. Margaret Hendry born 23 Aug 1812, Alloa, Clackmannashire. Margaret's birth is recorded in the Alloa parish register. Margaret Hendry married John Eadie on 4 January 1835 in Barony, Lanarkshire. John was born about 1811 in Alloa, Clackmannanshire. His parents were recorded on his later death certificate as John Eadie, a "Coachman", and Ann Taylor. No record of his birth has yet been located to confirm this. Margaret Eadie born about 1838. Margaret married James Smith on 10 Jun 1864 in Calton, Glasgow. James was born on 4 Mar 1836 in Campbeltown, Argyll. James and Margaret had one known child. Margaret's husband, James, died on 1 Jun 1869 in Mission Coast Home, Kyleshill, Saltcoats. She died on 5 Sep 1914 in 26 Holyrood Quadrant, Glasgow. 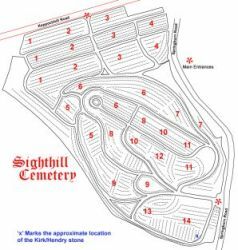 Margaret was buried in Sighthill Cemetry, Springburn, Glasgow. Ann Eadie born about 1840. Ann married William McKellar on 11 Apr 1873 in Barony, Lanarkshire. William was born about 1831. William and Ann had three known children. Ann's husband William died on 7 Jan 1880 in 3 Bedlay Street, Dennistoun, Glasgow. 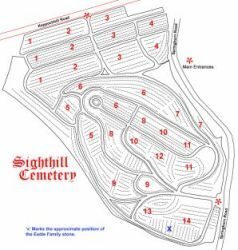 Ann died on 14 Sep 1891 in 9 Fraserbank Street, Glasgow, and was buried in Sighthill Cemetry, Springburn, Glasgow. Mary Hendry Eadie born on 23 Jan 1843. Mary married John Wilson about 1868 in Pennsylvania, USA . John was born on 7 Mar 1841 in Scotland. Mary and John had seven known children. Mary's husband John died on 5 Jul 1912 at River Street, Sandford, York, Maine, USA. Mary died on 5 Dec 1934, Sandford, York, Maine, USA. Isabella Thomson Eadie born about 1846 in Glasgow, Lanarkshire,Scotland. Isabella died, unmarried, on 1 Jul 1868 in Frasers Land, Keppochhill, Maryhill, Glasgow. She was buried in Sighthill Cemetry, Springburn, Glasgow. John Ebenezer Hendry Eadie born on 4 Jul 1850. John married Betsey McAulay on 25 Jan 1895 in Sandford, York, Maine, USA. Betsey was born in May 1856 in Islay, Scotland. John and Betsey had three known chikldren. John died on 4 Sep 1910 in River Street, Sandford, York, Maine, USA. Elizabeth Eadie born about 1852 in Glasgow, Lanarkshire, Scotland. Elizabeth died on 10 Feb 1862 in Frasers Land, Keppochhill, Maryhill,Glasgow. She was buried in Sighthill Cemetry, Springburn, Glasgow. Thomas Kirk Eadie was born on 28 May 1856 in Keppochhill, Maryhill. Thomas died on 23 Feb 1858 in Frasers Land, Keppochhill, Maryhill, Glasgow. For the census of 1841 Margaret Hendry and John Eadie were living in Keppochhill, Maryhill district, Glasgow with their daughter Margaret Eadie born about 1838 in Glasgow, Lanarkshire and Ann Eadie born about 1840 in Glasgow, Lanarkshire. For the census of 1851 Margaret Hendry and John Eadie were still living in Keppochhill. John Eadie is recorded as working as a "Bottle Packer" possibly at the nearby Imperial Glass Works. Their family had increased to five with the addition of Mary Hendry Eadie born about 1843 in Glasgow, Lanarkshire, Isabella Thomson Eadie born about 1846, (obviously named for her maternal grandmother), and John Ebenezer Hendry Eadie born about 1850 in Glasgow, Lanarkshire, (obviously named for both his grandfathers). For the census of 1861 Margaret Hendry and John Eadie were still living in Keppochhill. The accommodation is recorded as having two rooms with at least one window. Their family had again had grown with daughter Elizabeth Eadie born about 1852 in Glasgow. A son Thomas Kirk Eadie, (named after his mother's brother-in-law) had been born on 28 May 1856 in Keppochhill, Maryhill, but had sadly died of "Hooping Cough" on 23 February 1858 in Keppochhill, Maryhill. He was buried in Sighthill cemetery and commemorated on the Eadie headstone in Sighthill Cemetry, Springburn. On 10 June 1864 in Calton, Glasgow, Margaret Eadie, Margaret Hendry and John Eadie's eldest daughter, married James Smith, a "Coal Hill Clerk", son of James Smith, a "Carter", and Margaret Breckenbridge. . At the time of the marriage both parties gave their addresses as "Keppochhill, Maryhill Parish" and the witnesses were John Eadie and Robert Smith. James Smith was born on 4 March 1836 in Campbeltown, Argyll and at the time of his wedding his father was not marked as deceased, although his mother was. 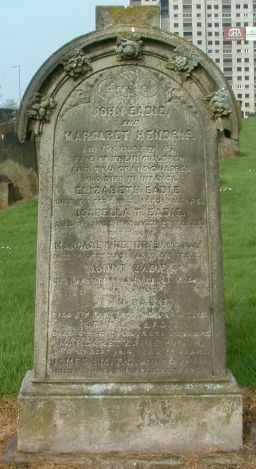 On 10 February 1862 Margaret Hendry and John Eadie's daughter Elizabeth who would seem to have been suffering from a disease of her hip for the last 15 months passed away. Sadly only 5 months later on 1 July 1868 Margaret and John's daughter Isabella Thomson Eadie, unmarried, and working as a "Steam Loom Weaver", also died, aged twenty-two of TB. Both deaths were recorded at Fraser's Land, Keppochhill, Maryhill, Glasgow, with their father John Eadie was the informant on the registration, and both deaths were commemorated on the Eadie headstone in Sighthill Cemetry, Springburn. For the census of 1871 Margaret Hendry and John Eadie were still living in Keppochhill, Maryhill, Glasgow. The accommodation is recorded as having two rooms with at least one window. Margaret Hendry and John Eadie's widowed daughter, Margaret Smith, nee Eadie, and her son James Smith were living with them, along with their younger daughter, Ann Eadie, and son, John Ebenezer Hendry Eadie. Their daughter Mary Hendry Eadie missing from this census had emigrated to the US in 1868. Margaret Eadie, nee Hendry, died four months after this census on 3 October 1871 at Fraser's land, Keppochhill, Maryhill, Lanarkshire, the informant on the death registration being her husband, John. The death registration confirms Margaret as being the daughter of Ebenezer Hendry, a "Carter", and Margaret Donaldson. Her passing was commemorated on the Eadie headstone in Sighthill Cemetry, Springburn. On 11 April 1873 in Barony, Lanarkshire, Ann Eadie, Margaret Hendry and John Eadie's daughter, married William McKellar, an "Engine Fitter", son of Archibald McKellar, a "Carter", and Elizabeth Wilson. Sadl William died only seven years after the marriage on 7 January 1880 at 3 Bedlay Street, Dennistoun, Glasgow. For the census of 1881 the widowed John Eadie was living at 9 Fraserbank Street, with his son, two widowed daughters, Margaret Smith, nee Eadie, and Ann McKellar, nee Eadie, along with his four grandchildren, James Breckenbridge Smith, Margaret Hendry McKellar, Elizabeth McKellar and Archibald McKellar. Whether the "Fraserbank Street" is the same as the Fraser's Land mentioned in he earlier marriage and death registrations is not known but would seem possible. For the census of 1891 the 80 year old John was still at 9 Fraserbank Street being looked after by his two widowed daughters. His son John Ebeneser Hendry Eadie missing from this census had emigrated to the USA. Not only are there two of his granddaughters also in the household but also Thomas Kirk, the grandson of Mary Kirk, nee Hendry, his late wife's sister. Thomas's mother Mary Blair had died at the time of his birth. (I am assuming that this is who this "Thomas Kirk - grandnephew" is despite the fact that Thomas is also listed in the house of his father Thomas Kirk over in East Street, Camalachie.) The accommodation is recorded as having one room with at least one window. On 14 September 1891 Ann McKellar, nee Eadie, died aged only 49. The death was recorded at 9 Fraserbank Street, Glasgow, and the informant on the death registration was her daughter Margaret H. Mckellar. This was followed 3 and a half years later by the death of her father John Eadie who died on 6 January 1895, aged 84. Again the death was recorded at 9 Fraserbank Street, Glasgow, but the the informant on was his daughter Margaret. His parents were recorded as John Eadie, a "Coachman", and Ann Taylor, although no record of his birth has yet been located to confirm this. Both deaths were commemorated on the Eadie headstone in Sighthill Cemetry, Springburn. Mary Hendry firstly married a William Davidson on 8 January 1837 in Barony, Glasgow, Lanarkshire. There is no record of any children to this union in the I.G.I. and one would assume that William Davidson died within the first couple of years of the marriage. For the census of 1841 there is a Widow Davidson recorded as living in Keppochhill, Glasgow who would almost certainly be "our" Mary. Margaret Kirk was born on 18 Feb 1845 in Glasgow, Lanarkshire. She was christened on 23 Mar 1845 in Glasgow, Lanarkshire. Margaret died, unmarried, on 10 Nov 1845 in Keppochhill, Glasgow. She was buried in Sighthill Cemetry, Springburn, Glasgow. Thomas Kirk was born on 6 Jan 1847. Thomas was christened on 24 Jan 1847 in Glasgow, Lanarkshire. Thomas married twice. His first wife was Mary Blair on 7 Feb 1873 in 67 Rutherglen Loan, Glasgow. Mary was born on 3 Jan 1848 in Barony, Glasgow,Lanarkshire. Thomas and Mary had three known children. Mary Blair died on 30 Dec 1890 in 20 East Hill Street, Dennistoun, Glasgow. Thomas subsequently married Margaret Warnock on 6 May 1898 in 526 Duke Street, Camlachie, Glasgow. Margaret was born on 20 Jul 1861 in Springburn, Glasgow, Lanarkshire. Thomas and Margaret had one known child. Thomas died on 11 May 1902 in 27 Comely Park Street, Dennistoun, Glasgow. Margaret died on 8 Aug 1922 in Bellfield Street, Camlachie, Glasgow. William Kirk was born on 31 Dec 1854 in Keppoch Hill, Barony, Glasgow. He died on 17 Oct 1855 in Keppoch Hill, Barony, Glasgow. He was buried in Sighthill Cemetry, Springburn, Glasgow. 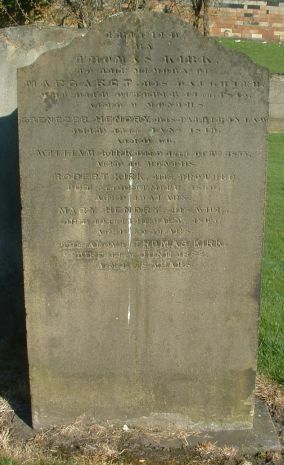 As recorded in the main text it would seem possible that at some stage Mary's father Ebenezer Hendry had come to live with the family as his death on 13 January 1849, aged 66, was commemorated on the Kirk family headstone in Sighthill Cemetry, Springburn. For the census of 1851 Thomas, Mary, and their son Thomas were living in Keppochhill, with Thomas working as a "Carter". In a slightly bizarre coincidence the Janet M Lyon recorded with her family in the following household to Thomas and Mary was almost certainly the aunt of the brother in law of my wife's great grandmother Mary Marshall. Over the next ten years Thomas and Mary had at least two children. A year and a half after this census Ebenezer Hendry Kirk was born on 1 October 1852 and christened on 7 November 1852 in Barony, Glasgow, Lanarkshire. (Obviously named after his maternal grandfather.) A further son William Kirk was born on 31 December 1854 in Keppochhill, Barony, Glasgow. Sadly William died on 17 October 1855 in Keppochhill, Barony, Glasgow. He was buried in Sighthill Cemetery and commemorated on the Kirk family headstone in Sighthill Cemetery, Springburn. For the census of 1861 Mary Hendry and Thomas Kirk, with their two sons, Thomas and Ebenezer Kirk, were living in Keppochhill, Maryhill, Glasgow. The accommodation is recorded as having one room with at least one window. Thomas Kirk, the father, is working as a "Coal Depot Labourer". Mary Kirk, nee Hendry, died on 10 February 1865 at Fraser's Land, Keppochhill, Maryhill, Lanarkshire, the informant on the death registration being her husband, Thomas. The death registration confirms Mary as being the daughter of Ebenezer Hendry, a "Carter", and Margaret Donaldson. She was commemorated on the Kirk family headstone in Sighthill Cemetery, Springburn. For the census of 1871 the widowed Thomas Kirk was living with his youngest son Ebenezer Kirk in Keppochhill, Maryhill, Glasgow. Thomas Kirk is recorded as a "Roadman" and Ebenezer was working in a "Spirit Shop". The accommodation is recorded as having one room with at least one window. For the census of 1881 the widowed Thomas Kirk had moved away from Keppochhill and was living with his eldest son Thomas Kirk Junior, his wife, Mary Blair, and their daughter Ages B(lair?) Kirk at 18 Bridgeton Cross, Glasgow. Thomas Kirk Junior is still working as a "Salesman in Spirit Merchant's", but his father, aged 76, although still giving his occupation as "Carter" is "Past Work". Thomas Kirk died on 14 June 1882 in 703 Gallowgate, Glasgow, the informant on the death registration being his son, Thomas. The death registration identifies Thomas as a "Carting Contractor", the son of Thomas Kirk, a "Gardener", and Maria Leishman, agreeing with the record in the IGI of the baptism on 16 November 1804 in Larbert, Stirlingshire of a Thomas Kirk to Thomas Kirk and Marion Leishman. He was commemorated on the Kirk family headstone in Sighthill Cemetry, Springburn.